As part of Governor Chris Christie's chosen delegation on his recent state visit to Israel, Rabbi Yosef Carlebach participated in a hour long visit with Shimon Peres, President of Israel. The delegation was greeted by the President, and heard a warm welcome. President Peres asked the group if they had any particular subject or interest that he could address. When Rabbi Carlebach asked if there was a "Passover Message" from the President to the Jewish community in New Jersey, the President responded and explained that he believed that "the Festival of Freedom" was not only a historical account of the miracles of Exodus from Egypt, but also a process of how individuals today can become free from their limits. He recounted how the history of Israel itself should be a lesson of Pesach and how celebrating this Holiday gives our people hope for a great future. The President thanked Governor Christie and his family for their first-ever visit to Israel and expressed his wishes for the continued success of the Governor in his future endeavors. The President concluded the historic visit with good wishes for the upcoming Festival of Pesach to all communities in New Jersey. 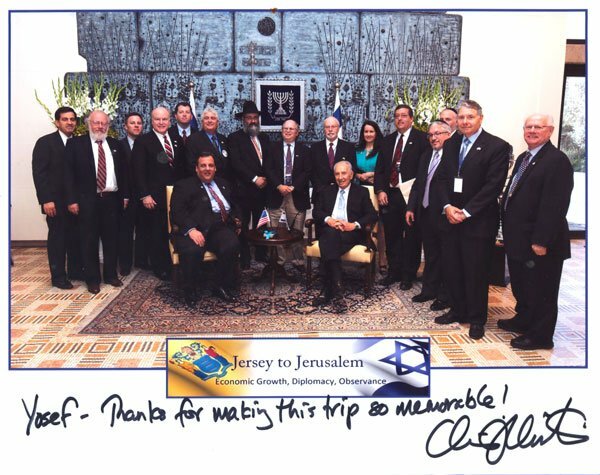 Governor Chris Christie and NJ Delegation with President Shimon Peres. 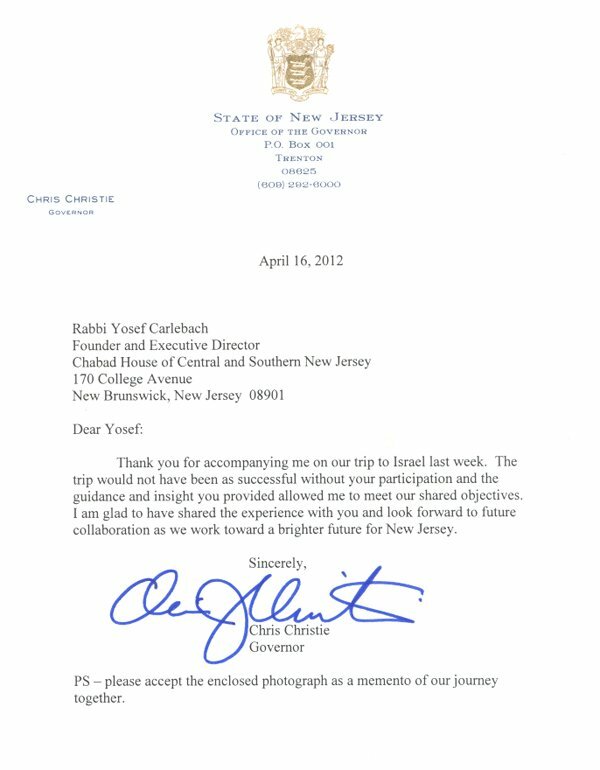 A letter of thanks sent by NJ Governor Christie to Rabbi Yosef Carlebach, Exec. Director of Chabad House at Rutgers and Chabad of Central and Southern New Jersey.